Bristow is the firm’s master of desk top football; he is unsurpassed in construction of paper aeroplanes (and noted for it in the Chester-Perry Who’s Who) and he can sing Don’t Cry for Me Argentina to the tune of They’re changing guard at Buckingham Palace, a feat for which he is rightly held in awe by the otherwise cynical postboy. 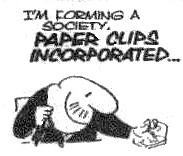 He is also President of Paper Clips Incorporated (membership: 1). Bristow would much rather be known for his writings but with the exception of Toady Thompson everyone regards them as utter rubbish. His ultimate hobby is the study of the well-known book "Brain surgery for beginners" but his study has brought him not one jot nearer achieving his ambition of becoming a brain surgeon. All these important (!) matters are reviewed below. Desktop football is played with coins and a ruler (on those days when anyone actually has spare coins) (This game has been played by the author of this website, many years ago, when he too was in an office with time to spare). In the days before decimalization the normal kit was a sixpence for the ball and two pennies a side for the men. The players face each other across the length of a desk. Two-inch strips in pencil at each end mark goals. Players take it in turns to use the ruler to flick one of their men either at the ball or anywhere they choose on the desktop. If the ball goes over the goal line, it’s a goal. Goal! Bristow goes one down. The style of the striker is not recommended for beginners - the ruler should be held length-on in the manner of a snooker cue. The game is deceptively difficult. The harder the man is struck, the more likely that the ball will fire off the desk, giving the other player a "throw-in". If the other player is in a good position to score, merely moving a man in front of the ball can make it impossible for him to get through to the goal. Skilful players take as much time moving their men into useful positions as they do in hitting the ball. One man may be left permanently as a goalkeeper, but of course as soon as he is used to flick the ball away, he will be out of position and a turn must be expended in moving him back. Bristow’s book writes the definitive guide to the game. He takes a conservative position to the rules "Dress: the referee shall wear a black jacket and pinstriped trousers". Strip 4378a was published in Bristow Latest. It was drawn for Saturday May 5,1975 and therefore was not published in the Evening Standard. It was published in Bristow Latest from where this scan is taken. And from time to time Hickford will watch a game so that he can write it up in the House Journal. Surprisingly, there is no inter-firm league - it would be a joy to see Bristow and Co. against the finest from Gun & Fames, Myles & Rudge and Effandee Holdings. Strip 3569 was published in the Evening Standard in August 1972. Apologies for poor quality of scan. Bristow demonstrates his mastery of this ancient art on the day he creates the Briscorde, a droop-nose sleekly dynamic arrow of a craft, built from specially selected materials (a page from the House Journal). Unfortunately on the test flight, on the roof of the C-P building, it falls like a stone. Bristow is undaunted. To Jones' admiration he sets out at once to create the Briscorde Mk II. Strip 4883 was published in the Evening Standard in May 1977 and in Bristow vs. Chester-Perry. This scan is from the Glasgow Evening Times May 1977. Strip 5579a was published in the Glasgow Evening Times in February 1980 and in The Penguin Bristow. It was intended for publication on a Saturday and therefore not published in the Evening Standard which ceased publishing on Saturdays in November 1974. Strip 5311 was published in the Evening Standard in January 1979. This scan is from the Sydney Morning Herald February 1979. Strip 2338 was published on frankdickens.com in May 2010. Strip 4818 was published in the Evening Standard in January 1977. This scan is from the Melbourne Age February 1977.